Maritime Security, “HMS Somerset, anti piracy patrol dawn on the Red Sea”. HMS Somerset, anti piracy deployment with Saudi Navy. This picture was painted as a surprise gift from the wardroom officers to their retiring Captain. 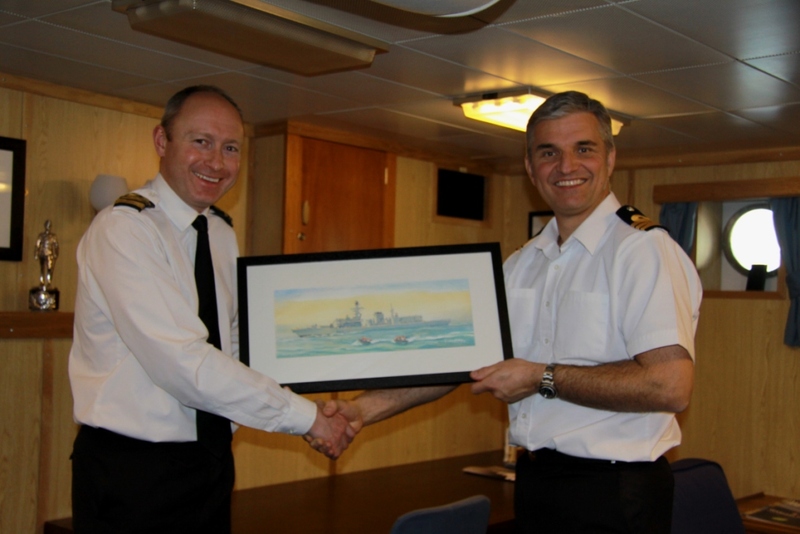 The Photograph below shows the Executive Officer (XO), Lt Cdr ‘Des’ Hirons, presenting the painting to HMS SOMERSET’s outgoing Commanding Officer, Cdr Paul Bristowe RN. 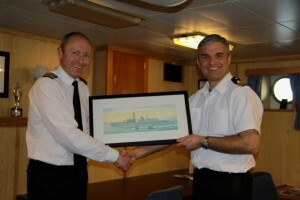 Lt Cdr ‘Des’ Hirons, presenting “HMS SOMERSET” to Cdr Paul Bristowe RN. About“HMS Somerset, anti piracy patrol dawn on the Red Sea”. When LT CDR Paul Evans of the Devonport based type 23 frigate HMS Somerset contacted Gordon Frickers Paul already had an idea for a painting in his mind. He also had a price, frame and deadline in mind. Happily when shown the completed art work in Plymouth Cdr Paul Evans was delighted with the painting enabling the picture to be taken in good time to a specialist framer. Thanks to our though pre planning the new watercolour was produced in record time, on time in budget. The brief was quite specific: HMS Somerset (Type 23 frigate) on anti piracy exercise in the Red Sea with RIBs deploying. This precise brief enabled us to quickly agreed a way ahead. The completion date to be no later than the evening of 6 Dec. The painting to be representative of her previous patrol. Ship to be painted as a melange of Royal Navy 2 photos taken by LT CDR Paul Evans. The ship as photo 1, with ribs (rigid inflatable boats) as per photo 2. Sea state to be as photos supplied, lighting to be early morning so the sky will be a variation of Naples yellow and blues possibly with the sun on the horizon which would cause the sea to appear dark turquoise and greens. It was agreed to follow Gordon Frickers recommendation and choose a sort of colour scheme known to be generally popular, avoiding the obvious use of blues and turquoise. A blackframe was specified, all prices being ex studio, ex frame. We agreed to meet in Plymouth to check details of the completed painting prior to it going for framing. HMS Somerset although a ‘standard’ type 23 frigate has a number of minor unique details. That said Gordon’s main concern was to produce an acceptable ‘navy grey’. As one would expect particularly with watercolour it was quite inappropriate to match the grey shown in the supplied photographs. Wisely we had chosen a dawn scene were distance and light always modify colours which lead to a happy eventual result. As the deadline was critical there was no room for errors so Gordon Frickers adopted a technique often used with water colour. To simultaneously produce more than one painting. This enables the artist to ‘experiment’ on one picture with out spoiling the other. Particularly in the case of watercolours which are very sensitive to accidents during creation, this technique guards against the chance of an accident ruining a near complete picture. Invariably the best results are transferred to the second painting thus both evolve to become successful finished works. The ‘spare’ painting Gordon Frickers usually keep as a ‘sample’ ~ unless some one makes an offer he can’t refuse. Cdr Bristowe assumed Command after SOMERSET returned from the Arabian Gulf in Dec 2011. Following a comparatively short regeneration period, SOMERSET deployed back to the Middle East in August 2011. SOMERSET conducted maritime security operations in some of the world’s most vital sea lanes during which time she actively disrupted acts of piracy, returning to the UK in February 2012. This splendid painting was funded by the officers who had served under Cdr Bristowe throughout his tenure as Captain. Although SOMERSET was tasked to conduct Maritime Security operations, she was equipped with a comprehensive air, surface and subsurface capability. Prior to deploying her sailors were trained to respond to any tasking, ranging from humanitarian aid to full maritime warfare. Cdr Bristowe relinquished Command to Cdr Mike Smith RN on 11 Dec 12. After completing a planned upkeep period in dry dock at Devonport by Babcock Marine, SOMERSET sailed for sea trials in the New Year after which she commenced operational sea training in preparation for redeployment. “Thanks again for your work. The (former) CO really appreciated it. In turn, my thanks to LT CDR Paul Evans for this commission. Paul had a good idea, was very easy to guide and work with always doing what he said he would do and being open to discussion to achieve a suitable result, a real sea man. This is the second painting I have produced in secrecy of a British type 23 frigate. The ‘other’ was of HMS Marlborough and produced an amusing quote (below) following her conversion for the Chilean navy. Captain John Simkins was director, the Chief Executive, Disposal Services Agency of the Ministry of Defence therefore the inspiration of and responsible for the painting and the recommission.